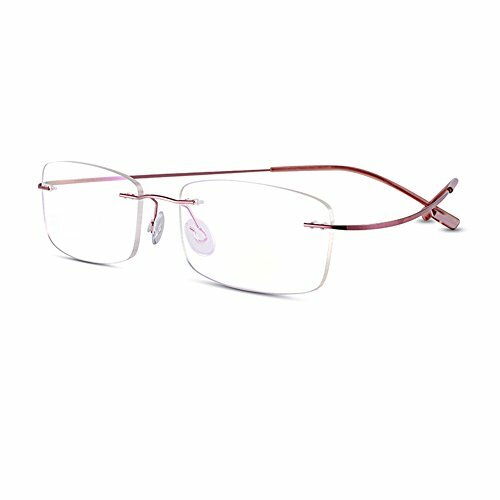 Not only are rimless glasses a functional item, they are also elegant and stylish. A pair of rimless eyeglasses has the potential to transform any look from ordinary to extraordinary, offering a super-cool accessory to your outfit. If you pair them correctly with your face shape, hair style and outfit, you can guarantee a practical accompaniment that will never go unnoticed – and in a great way. First, you need to select the best rimless eyeglasses for you. That is why we have created this list of top 5 rimless eyeglasses for you to choose from. Let’s take a look and see which are best for you. If you are looking for glasses that are very flexible and will not break when placed under stress, these lightweight glasses by Eyekepper may be just what you have been looking for. 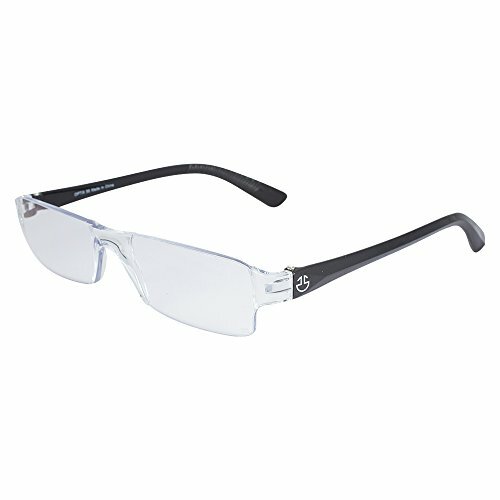 These rimless glasses are made with durable titanium arms and plastic, non-polarized lenses, which are sturdy and strong. Since they’re so tough, you don’t need to handle the lenses too gently when putting them on your face or folding them away. The lens width is available in 43, 46 and 48 millimeters and suits the shape of most people’s faces. The lens height is also 46 millimeters, making these glasses rounded and bold. The bridge is 19 millimeters wide, allowing the glasses to perfectly rest on your nose, and the arms are 125 millimeters long and can be bent without breaking. These glasses are suitable for both men and women. The comfortable nose pads ensure that they are super comfortable to wear, even for longer stretches of time. The glasses are so lightweight that you might forget you are even wearing them. The plastic lenses can be removed and replaced with prescription lenses. The glasses come with a soft microfiber cleaning cloth and a hard storage case to keep your specs in tip-top condition. In today’s tech-driven world, we look at screens a lot, which means many of us need glasses that are anti-reflective to help us see properly without getting headaches and eye strain. These glasses are the perfect solution if you spend much of your day in front of a computer. These reading glasses have sturdy plastic frames and non-polarized, anti-reflective lenses that are durable and clear. Their sleek size suits most face shapes and ages. The classic shape offers wearers a stylish and fresh look when wearing these glasses. The Optix 55 glasses have smart black 135-millimeter arms which fit snugly behind your ears. The hinged temples ensure that the glasses fit comfortably without pinching your face. The glasses are comfortable and lightweight, so you can wear them for extended amounts of time without any discomfort. You can also easily look over the tops of the lenses when you need to look further away. You can select from a variety of magnifications from 1.0 to 4.0 diopters. The frame height is a sleek 18 millimeters and the lens width is 50 millimeters. The anti-reflective coating blocks out the blue light from screens that can cause headaches, pain and discomfort when watching TV or using a computer. COMPUTER LENSES: These lenses have a anti-reflective coating which blocks the blue light that emanates from computer screens and TV monitors, and often cause pain, headaches and discomfort. PERFECT FOR THE OFFICE: Especially helpful for those using a computer, smartphone or any screen at work all day. The anti-glare coating helps prevent fatigue and protects the eyes from harmful rays. 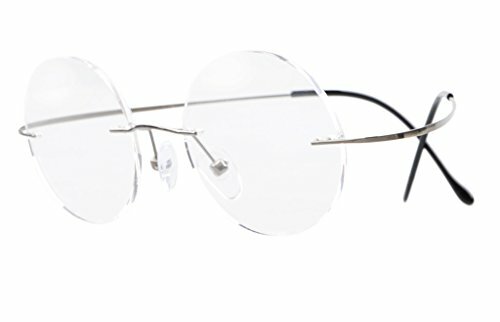 These trendy, stylish rimless glasses are great for everyone. 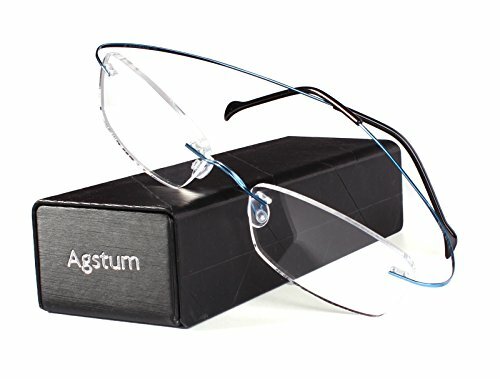 Whether you have a prescription or want glasses as a chic accessory, these Agstum specs may be just what you’re looking for. The glasses are durable and bendable, so it’s very unlikely that you will break them. The frame is made from titanium, which is sturdy and strong. The lenses are plastic and non-polarized, making them great for any user. The lenses are adjustable and you can get them with a width of 52 or 55 millimeters, so you can find a pair that fits you best. The lens height is 31 millimeters, which looks good on most faces. The bridge is 18 millimeters to fit well on most noses, and the flexible arms are a standard 140 millimeters. These eyeglasses are designed to look smart and sophisticated on both men and women. They are perfect for home and work use, particularly if you are fashion conscious. The titanium arms are so light that you almost can’t feel them when they are on. Not only do they give you one of the most comfortable fits available, they are also very durable, saving you time and money in the long run. You can switch the lenses for your prescription lenses at your local optometrist if you want – these eyeglasses are perfect for this purpose. The titanium frames have a lifetime warranty and the glasses have a 30-day money-back guarantee. If you are looking for a pair of glasses that are so lightweight that you hardly feel them when wearing them, these flexible and durable titanium alloy glasses may be perfect for you. These glasses are naturally attractive, bringing a sense of sophistication to the person wearing them. They are perfect for both men and women, and suit people of any age. 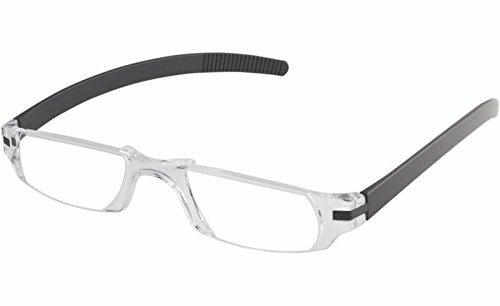 The titanium frames are durable and strong. The interchangeable, non-polarized lenses are extra clear and can be swapped for your prescription lenses if desired. The bridge is 20 millimeters wide to fit comfortably on your nose. The sleek yet simple design allows these glasses to be worn at home or around the office. The glasses are lightweight and boast a classic look that will not age you. The glasses have a lens width of 52 millimeters and a height of 29 millimeters, making them look sophisticated and trendy. The arm is a 135 millimeters, making these glasses great for most adults to wear comfortably. These eyeglasses are available in 4 colors: pink, purple, red, and brown, so you can find one that suits you, or you can choose all of them and pick a color each day. These glasses come with a glasses case, a cleaning cloth, a mini screwdriver, a pouch and two anti-slip covers. If you would like a pair of glasses that can be worn indoors as well as outdoors, these glasses by Fisherman Eyewear could be right up your alley. These modern glasses by Fisherman Eyewear have a strong polycarbonate construction that is both comfortable and lightweight enough to wear every day. They have a refined style that looks great on most faces and ages. They can be worn by both men and women. The slim and classy design ensures that these eyeglasses are flexible and fashionable, no matter whether you wear them fishing, hunting, around the office or at home. They are a reasonably priced alternative to purchasing prescription readers that may get damaged depending on your activities. These reading glasses are available in three different colors (black, green camo and tortoise), all of which look modern and chic. You can also choose from six different diopter magnifications. The Fisherman Eyewear glasses boast a limited lifetime warranty which speaks to the company’s confidence in these specs, allowing you to rest assured that you have a good pair of peepers. Being able to see clearly is obviously important, but you don’t want to compromise your self-esteem in the process either. Buying a pair of rimless eyeglasses allows you to have crystal-clear vision while maintaining a styling and chic appearance. While all of the above eyeglasses are well worth the money, our favorite pair is the Eyekepper Titanium Rimless Eyeglasses because of their strong and durable titanium arms that are lightweight enough to make you forget you are wearing specs in the first place. The nose pads are comfortable and these glasses can be worn by both men and women. They also come with a cleaning cloth and storage case, which is a nice added bonus.